Fee goes up soon. Hurry! Challenger International Soccer provides the most unique, fun soccer experience for any child who loves soccer! The Challenger International Soccer is the most popular soccer camp in the country. Challenger has been conducting soccer summer camps for over 20 years. 100,000 campers participated in 4,000 camps last summer throughout the U.S. The Coaches are from Europe and South America which gives the program a unique experience. Each coach is certified, screened, and background checked to ensure a safe environment for the kids. There is a limited camper to coach ratio to ensure maximum attention to each camper. Their experienced staff has studied the game at all levels and have identified the key techniques and skills that players should work on in a fun and positive atmosphere. The Coaches love soccer and want the campers to enjoy and love playing and having fun and learning all at the same time. The Coaches make teaching so much fun, the campers don’t realize how much they are learning. Challenger International Soccer Camp will also feature a groundbreaking technology partner which will provide players with an app based platform which will help them prepare before camp, learn skills quicker and more efficiently during the camp, and then help them to continue their education and skill development with camp homework and on-going virtual training throughout their season. The curriculum will contain a selection of age & ability appropriate drills and practices used by coaches throughout many countries in Europe and South America. This combination of on and off-field skill development will both engage and entertain players and will encourage them to push the boundaries of their talents. Each day the coaches will take the players through an age appropriate progressive series of fun skill building practices from unopposed, to opposed, game related and finally into a game. Defending - improve defending skills and learn how to defend. Freestyle - daily program of juggling, lifts and balances by World Record Freestyler - John Farnworth. Games - play actual games in small sided environments using the skills learned above. Important: All skills and techniques are taught always in a fun and positive atmosphere. The Coaches make teaching so much fun, the campers don’t realize how much they are learning. 1 hour sessions (if available in your area). You may sign up at any time, even the first day of camp. Space is limited, though and is first come, first serve. All Campers receive a FREE Challenger International Soccer T-Shirt and Soccer Ball at the camp site on the first day. Register 30 days BEFORE camp start date and receive FREE Replica Jersey (Valued at $35) (add Shipping and Handling - $7.95). A $10 fee is added if you sign up 10 days before the first day of the camp. With late registrations, there can be a delay in getting your free ball and T-Shirt. Hosting a coach can be a fun for the whole family! Read more about Hosting a Coach in your home for the week. 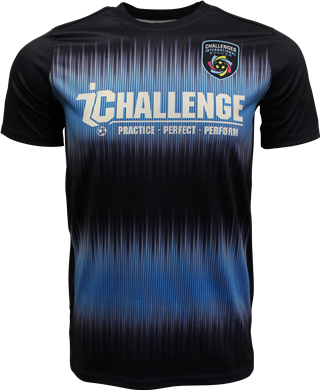 Challenger International Soccer provides a FREE Challenger International Soccer shirt and FREE Challenger International Soccer soccer ball to every camper at the camp site on the first day. Review the required and optional equipment list below. No dogs, tents, canopies, (hand held umbrellas are ok) or smoking at the camp. Refunds are unavailable 10 days prior to the start of the camp. Refunds for health reasons are prorated if the child attended some of the camp. $40 administrative fee will be deducted from your refund amount. Host-A-Coach is fun, you make a new friend, and you have a cultural learning experience for the whole family! Hosting has become one of the most popular elements of FFPS Challenger International Soccer. FFPS Challenger International Soccer Coach lives with you for the week of your camp, Sunday to Sunday. An adult should be at home at all times during this week. You must have an extra bedroom and bed. Food is optional, but, most hosts over feed their Coach. The Coaches have their own transportation. In return, not only does the family enjoy a unique week learning about soccer and building lasting friendships with their Coach (WARNING: it can be very emotional when your Coach leaves), but, for your generosity you will also receive: An $80 rebate for each coach hosted. If interested or if you have any questions about Host-A-Coach, select 'yes' or 'maybe' in the dropdown when you sign for the Challenger International Soccer in the Hosting Section or call Jack at 713-907-4907 or email jack@ffps.org or call John at 281-615-8535 or JohnH@FFPS.org. Any questions please call Jack at 713-907-4907 or email Jack@FFPS.org or call John at 281-615-8535 or JohnH@FFPS.org.